Probably around 1983 or so, my parents thought that my brother and I needed ventriloquist dummies for Christmas. 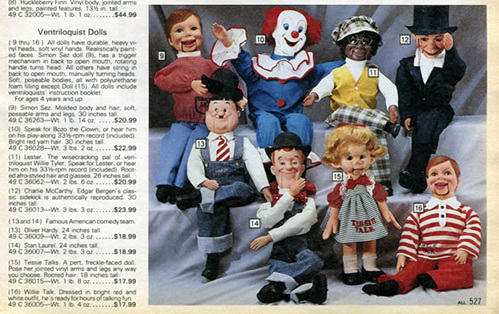 Ordered from the annual Sears Wishbook, there were several for them to choose from. Laurel and Hardy (13 & 14 below)? The classic Charlie McCarthy (12)? Maybe Lester (11), the "wisecracking pal of ventriloquist Willie Tyler?" Apparently my parents did not want to take the classic approach and were looking to spend the extra few bucks. Based on their best judgment, my brother got Simon Sez (9) and I got Bozo the Clown (10). Now don't get me wrong. I'm not saying that my parents made poor selections. 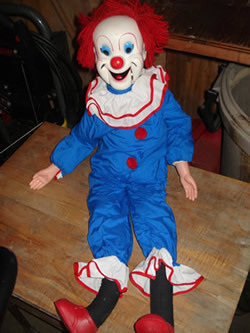 I'm just wondering what thought process took place when they decided that a plastic-headed boy in a pink shirt was best for my brother and I was best suited to own a clown with hair made of red yarn. Bozo was a little difficult to operate as he was limited to moving his mouth only -- this was done through the use of a string coming out the back of his neck. Simon Sez was operated through a hole in his back which could be used to move not only his mouth, but his neck as well. 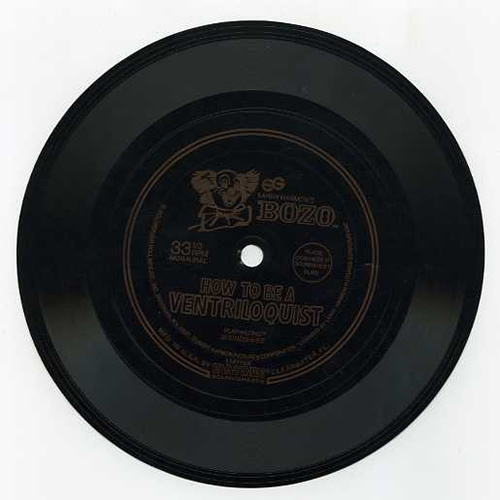 While Bozo wasn't the most kid-friendly doll on the market, he did come with a floppy instructional record to be used in learning the basics of ventriloquism. Surprisingly, this record is still a part of my record collection today and I was amazed to find that it plays through in its entirety -- completely free of skips. Also surviving the test of time are the ventriloquist dolls themselves. Bozo still works as he used to, but Simon's mouth trigger no longer functions properly. Also, there seems to be something lodged inside Simon's heads that rattles when shaken -- maybe an M&M. Even the orginal boxes are intact -- at least the Bozo box is. The Simon Sez box has seen better days as it was used on multiple occasions as a fighting ground for my brother's He-Man figures. I never really got much use of out Bozo. 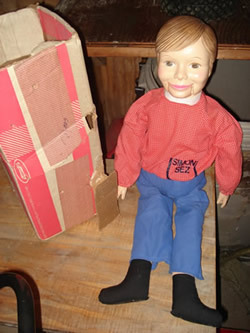 For a fourth grade show-and-tell, I actually took my brother's Simon Sez instead of my own doll. For the record, I didn't demonstrate my ventriloquism talents during show-and-tell. Instead, I sat on a stool with Simon on my knee and made my classmates endure Simon's four-minute "lip sync" of The Dream Academy's Life in a Northern Town. Regardless, as an adult I have learned the value of a dollar. As I look back at the catalog listing for these dolls and realize that my parents dropped over 40 bucks on them, I appreciate this gift more than ever. Reminds me of the Freaks and Geeks episode where Neal gets a ventriloquist dummy. I've never seen them as kids toys myself. Ah! Freaks and Geeks...what an underappreciated show. Good call bringing up the ventriloquist episode! I had a Charlie McCarthy (still do) and I spent forever trying to "throw my voice" and not move my lips. Today I watch a lot of old Bergen and McCarthy routines and I am stunned to find Bergen ALWAYS moved his lips. My ventriloquist confidence would have been so much higher if I had known! I plan to check it out if I am ever in Kentucky. Thanks for the links, Guy. 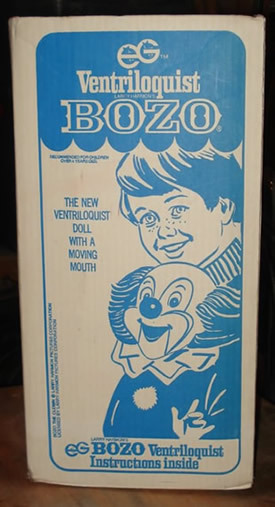 I didn't spend too much time working on my ventriloquist skills as a kid but I definitely gave it a shot with the help of that Bozo record. To this day I still remember the letter B is to be replaced with the "th" sound. As the record says: "The thoy went to store."